Develop a recovery strategy before your computer fails. Even a basic plan is superior to no plan at all. won't have access to the Internet. Recovery media has been replaced by recovery partitions in today's computers so you usually need to create your own recovery media. The system must be in good working order to create the media. Some systems require recovery media to access the recovery partition. If the hard drive fails, recovery media is the only way to recreate the recovery partition. Some manufacturers (like HP) will only let you create the recovery media once, so you need to store the media safely where you'll be able to find it. Recovery media will generally offer the option to recover either just the operating system or a factory restore (restores the computer to the condition it was when shipped from the factory). In either case, the only way to ensure that you can recover your data and programs is to have a recent and reliable backup of your data (photos, documents, emails, etc.). The more recent and complete your backups, the more likely you'll be able to recover everything you lost in a crash. See Backup & Recovery Strategies for more about developing a strategy that suites your requirements. Windows provides a number of recovery tools that can help you recover from problems with Windows without resorting to a clean install (wiping the computer and reinstalling everything). Try these methods first, then move to a clean install if you're unable to recovery your computer. Depending upon the version of Windows you are running the files needed for a system recovery differ. The recovery tools for Windows Vista and 7 are similar and described below. See the sidebar for specifics on how recovery is accomplished in Windows 8.1 and 10. Recovery from a severe crash or system instability that won't allow Windows to load correctly requires advanced knowledge when using these tools. Be sure to keep a recent backup of all your important data. Having your data and program settings backed up will give you more options, especially if you have to call upon a professional to restore your system. Many technicians won't bother to try to recover data, but simply restore your computer to working condition. It takes time to recover data from a non-working system and many folks save files in unusual locations. Most shops do not bother with backups in order to stay "competitive" and avoid issues with missed data. Modern Windows versions have a recovery function called System Restore (it may be turned off by default in Windows 10). System Restore keeps track of significant files and settings in Windows, so that you can recover from a corruption in Windows caused by a bad software or driver installation. System Restore keeps a series of restore points (a backup of various critical Windows files at a certain time, including registry entries and drivers) in a hidden area on the hard drive. 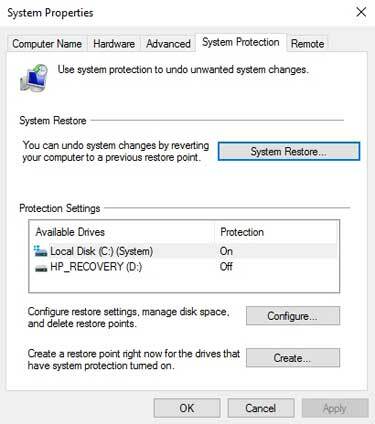 Windows automatically makes certain restore points, but you can also create a restore point prior to making a change to your system that you might need to undo. System Restore will neither affect your data nor recover lost data or programs. If your Windows loads OK you may be able to use System Restore to return your system to a state before a problematic driver was loaded or your Windows Registry was corrupted. Be sure to close all running programs before starting System Restore. There are various methods of opening System Restore, depending upon your version of Windows and how it is configured. Windows Vista and 7 can click on Start ⇒ All Programs ⇒ Accessories ⇒ System Tools ⇒ System Restore. The settings are found in System Properties on the System Protection tab. Windows 8 users can search for “restore point” in settings. Windows 10 users can right-click on the Start menu then select System then System Protection (you may need to enable System Restore in Windows 10 so that you can undo a bad Windows Update). You can only use System Restore on the drives where it is enabled via the Configure button. Clicking on System Restore will allow you to restore your computer to an earlier time (you can choose a different restore point than the one recommended). Clicking on Create allows you to create a new restore point. How to Use Windows System Restore from the Command Prompt. Safe Mode starts a minimal Windows environment with only the essential drivers and files are loaded. Video resolution is greatly reduced and startup programs are not launched. cleaning up malware or virus infections (these often reinstall themselves at boot time from hidden files). Windows 8 and 10 were designed to run on the UEFI boot environment rather than the BIOS system used in earlier computers so the process is a little different. The Shift+F8 key combination will NOT work in Windows 10. Microsoft's Start your PC in safe mode in Windows 10 includes instructions on how to exit safe mode. How to enter Windows 10 safe mode (video). How to boot into Windows 10's Safe Mode has the above video embedded but includes other options. Try pressing the Shift+F8 key combination or just hold the Shift key and click Restart from within Windows (or at the login screen). To see the advanced boot options, restart your computer then press the F8 key repeatedly after the BIOS message disappears (or the initial BIOS beep) but before the Windows logo appears (usually only a few seconds). You may need to toggle the F-Lock key (if it is present), to enable the F8 key. 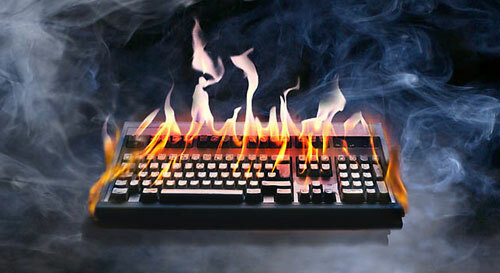 If the computer begins to beep continually, release the F8 key. If you see the Windows login screen, you'll have to let Windows load then restart your computer to try again. Safe Mode with Networking provides access to other computers on your network and to the Internet. Last Known Good Configuration restores Windows to the condition it was in when it last loaded correctly. Start Windows Normally will load Windows in the regular fashion. If you were having problems last time you attempted to load Windows this option may not work. Additional options exist, but most users are unable to take advantage of them. Each Windows version has some sort of a bootable recovery option or disk. See Recovering Windows in the sidebar. If you don't have the ability to recover your computers operating system and programs you'll need to perform a clean install. A clean install is usually a last resort when all other recovery methods have failed, but Windows occasionally needs to have a clean install to remove accumulated problems with software. If you're uncomfortable with this process, hire a professional to do it for you. Be sure you have backups of any data since things can go wrong. The shop is not liable for your data. You know whats important to you and what can be ignored. Ensure you have the installation media and license keys for all software (particularly software you purchased online). Deregister any programs that are restricted to on computer to preserver the rights to reinstall it again afterwards (such as Adobe Photoshop not licensed using a Creative Cloud subscription). This function is usually in the Help or Options menu. Uninstall any programs that require it. If unsure, uninstall the program. In situations where you're unable to do this (such as a hard drive failure), you may lose all your data and programs — which is why a recent backup is critical if you care about your photos and other data. Some software providers may provide the ability to reinstall a registered program if you contact their support department and explain that you've lost the ability to recover a functioning Windows installation. If not, you'll need to purchase the program again. Once you've completed the preparation, you can reboot the computer with either the Windows installation DVD or recovery disk provided by your computer manufacturer (or created when you got your computer if the computer didn't come with one). During this process you will destroy ALL information currently on the disk. As the computer reboots, choose the option that allows you to boot using the recovery disk or Windows installation disk (the method varies by computer: try F12). Recovery choices depend upon what method you're using. The examples below are for Windows 7, but most other Windows versions should work similarly (Windows 8 and 10 have special settings in their recovery tools to do a clean install). Choose the custom (advanced) install rather than the upgrade. You'll need to format the existing partitions (at least the current C: partition). Optionally, you'll want to delete all partitions and let Windows create the partitions it needs. WARNING: deleting or formatting partitions wipes all existing data. The DVD will copy installation files onto the hard drive then Windows will reboot several times as it completes the install. During the first reboot you'll want to be sure that the computer boots to the primary hard drive, NOT the Windows DVD. Most laptops and many name-brand computers don't come with a Windows or drivers CD. Instead they rely upon a hidden recovery partition. To ensure your ability to reinstall Windows, you'll need to create the recovery CDs or DVDs while your system still works then put them in a safe place. This option varies by manufacturer, but most will depend upon a hidden recovery partition on the primary hard drive plus a DVD or CD recovery disk to start the process. The recovery partition and the recovery disks are the only sure way to restore Windows and the programs that came with your computer. Your system needs to be in good working order to create these recovery disks. When your computer has problems you probably will be unable to create them. Some manufacturers (like HP) will only let you create the recovery disks once. You may be able to order recovery disks from the manufacturer provided they still support your computer, but they are usually expensive and you'll have to await delivery — something that may seem unimportant until your computer quits working. Most systems require a special boot disk (created in this process) to access the recovery options. These recovery disks are your only option if the hard drive fails or if you want to install a new hard drive on your computer. You cannot copy the recovery partition; it must be created using the recovery DVD. What if You Lost the Recovery Media? Sometimes you can re-install Windows using an Windows installation DVD — provided the Windows installation DVD is the same version as your license. You'll need to download the drivers for your computer model from the manufacturers site. It can be difficult to determine which drivers to install, especially on a laptop. There is usually multiple variations of the hardware within the same model of computer and you'll need to know the exact drivers for your particular computer. There is no guarantee that the manufacturer will retain the drivers for older versions of Windows. The manufacturer wants to sell you a new computer. Like the Windows Installation Disk, you'll boot to the recovery disk and follow instructions. There is generally at least two options: one that retains the programs and data (a repair) and one that restores the computer to the condition it was when it was shipped from the manufacturer. This second option is the clean install option during which all existing programs and data will be destroyed. The computer will be restored to the condition it was when shipped including the original (not updated) versions of programs and will not include any personalization you've made since buying the computer (or last reinstalled Windows). Uninstall any obsolete or unnecessary programs (like old versions of Java, Adobe Reader, FlashPlayer, obsolete security software, etc.). These make your computer unsafe. Run Windows Update to install all recommended updates. Optional updates may be necessary to update drivers. Microsoft has made it difficult to fully update Windows Vista and 7 computers so you'll need to search for a solution (it can change monthly). Download and install a current version of security software, browser and plugins, utilities and other software. Configure and customize Windows to restore the look and feel you prefer. I recommend you keep a current list of the software you use on your computer and any license numbers required in a safe place where you can find them. This will make it easier to recover in situations like this. Windows 10 has a built-in recovery option that allows you to reset your computer (keeping your files), go back to an earlier build or advanced setup. To do a clean install, click on Start ⇒ Settings ⇒ Updates & Security ⇒ Recovery then choose More Recovery Options. Much like Windows 10, Windows 8 has recovery options that allow you to restore your computer with either the programs and data intact or with a clean install (if you are disposing of your computer or have difficulties with the recovery installation). If you're using a recovery partition on your computer, it may restore the earlier Windows 8. You'll then need to install the update to Windows 8.1. Create a system repair disc for Windows 7. Download a Windows 7 Recovery Disc from NeoSmart. Combined with the built-in enhanced capabilities for a system images and scheduled backups in Windows 7 you should be able to recover your system much more readily than ever before. Windows 7 also has a Windows Recovery Environment available from the Advanced Boot Options menu. Select Repair Your Computer from the Windows Error Recovery screen. The Windows Recovery Environment can also be launched from the Windows 7 DVD. Select Repair Your Computer when you see the Install Windows screen. Recover information for legacy Windows versions (those older than the ones listed on this page) are found on the Recovering Legacy Windows page. I do NOT recommend running older versions of Windows, especially if you're connected to the Internet. New vulnerabilities are unpatched in older systems yet they are often present.